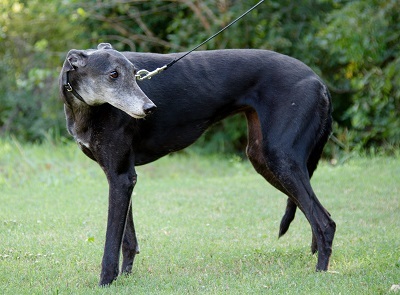 Elixar is an 8-year-old black female born in 2010. She was part of the population from the blood bank facility located in Cherokee, TX that closed in November 2017. Elixar has completed all of her medical procedures and is being medically evaluated by GALT's veterinarians for an irregular heart beat that was discovered during her dental. It is not yet known if Elixar is small animal or cat tolerant. 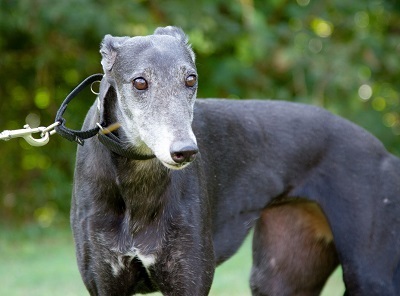 Please check back periodically for updates on Elixar as her journey to her forever home unfolds. Elixar is an enigma. She is perfectly content to do absolutely nothing at all. NOTHING….for 23+ hours a day! She must have had a troubled past which is why she’s so slow to trust and takes a while before she’ll make eye contact. Elixar is nervous about many things and will shake like a leaf when faced with new things. She took up residence in our spare bathroom when she first arrived and we set it up to be the most comfortable place she’d ever known. We indulge Elixar and bring meals to her. Elixar is free to roam around and instead prefers her personal space. Late at night she will come out and collect toys to bring back to her lair. Over time she has come out of her shell and will join me in my home office as my silent co-wagger. We have a unique way of communicating with each other. When Elixar wants to go out, she’ll do a full body shake and jingle her tags. I respond to her request and open the back door (our alarm system announces “back door”), that’s her all clear signal to walk through the house to go out and do her business. Elixar is quite private and prefers to not have a person outside, though she doesn’t mind if other dogs are outside with her. There are times I do have to go in and get Elixar up to go outside – a pat on the back or chest and a bit of encouragement usually does the trick. We’ve put up a baby gate every now and then to keep her from going back to “her room”. Her alternate location is a corner of the kitchen where we’ve placed a dog bed. It’s a way to get her a bit more interaction with sights and sounds in new surroundings before she naps. Speaking of naps, Elixar is a champion roacher and can lie like that for hours on end. When we bring breakfast or dinner, she will acknowledge by licking and smacking her lips. Poor girl has very bad teeth and has had multiple extractions. We soften her food with some warm water and she happily eats in private. Elixar will reluctantly go on a walk and is ok on leash. She rides well in the car and really doesn’t need other dogs in the home. If you don’t mind having a dog that isn’t interactive yet appreciates all the creature comforts you can offer, Elixar would be a perfect fit.